Monsignor Marcus Stock, General Secretary of the Bishops' Conference of England and Wales, came to preach at the Solemn Mass on St Philip's Day. 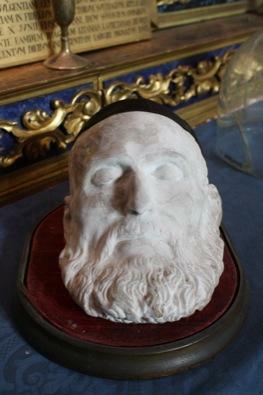 Below is his homily, in which he describes how in the summer of 1990, a few days before the arrival of the first Fathers of the Oratory, he discovered two long forgotten treasures: a cast of St Philip's death mask and St Philip's own copy of Blessed Jacopone da Todi's Laude. Firstly, I would like to thank the Provost, Fr Daniel Seward, and the Oratorian Fathers for inviting me to join them today for this their Patronal Feast Day. It is a great privilege and pleasure for me to be here. I feel a keen affinity with the Oxford Oratory, for in the summer of 1990, for a couple weeks, I had the privilege of living here to celebrate Mass and provide pastoral care to the parish until the first Oratorian Fathers for the new community arrived. A day or two before I left, I was wandering around the church and found myself in the chapel on the right as you enter at the far end of the church which contained the font and reliquary cupboards. The shelves of the upper cupboards were clearly empty and most of the lower cupboards. But one of the lower ones' was locked. I must confess that my curiosity got the better of me and, with a little knowledge gained from a youth ill-spent, I picked the lock and opened the cupboard. Inside the cupboard there were two main objects both within glass containers. One object had a glass dome covered in dust which obscured the object within. The other was a rectangular glass-sided reliquary which contained, what looked like, a very old book. I cleaned off the dust from the first object with the glass dome – and what greeted my eyes both startled and amazed me. For looking out at me was the unmistakable face of St Philip Neri. 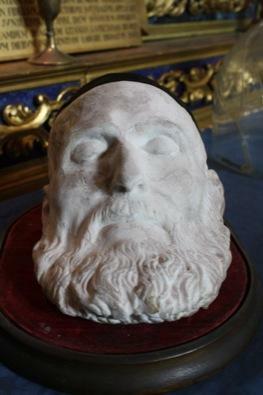 It was a copy of his death mask. 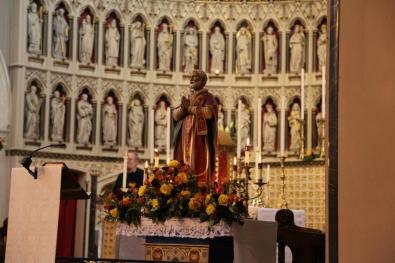 I recognized it straight away from the ones that are on his effigy, containing his relics, in the chapels dedicated to him in both the Chiesa Nuova in Rome and the Birmingham Oratory. The second object I will come back to later! Four hundred and sixty-eight years ago, on the eve of Pentecost in 1544, at the age of 29, Philip Neri a devout young layman who had moved from his home in Florence to work first for a relative near Monte Cassino and then as tutor in Rome, was praying in the Catacombs of Saint Sebastian, on the Via Appia. I am sure that many of you will already know, from your knowledge of the life of St Philip, of the remarkable event that took place on that occasion. During his prayer, St Philip had a vision of a globe of fire which entered his mouth, and descended into his heart. This spiritual ecstasy was accompanied by the physical expansion of his heart and he experienced a feeling of overwhelming joy. By providence, today, as well as celebrating the Feast Day of St Philip, we are also on the eve day of Pentecost. 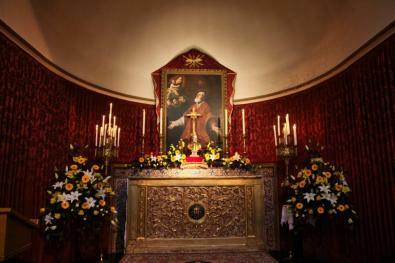 It was in the silence and stillness of prayer that the Heart of God spoke to the heart of St Philip. Cor ad cor loquitor, 'heart speaks to heart', an experience that another, future, great and holy man of the Church, Blessed John Henry Newman, was to discover too as the source of his joy. It is to St Philip's experience of spiritual joy, as the fruit of Pentecost, to which I would like us to turn our thoughts and devotion this morning. "Rejoice in the Lord always; again I will say, Rejoice. Let all men know your forbearance. The Lord is at hand. Have no anxiety about anything, but in everything by prayer and supplication with thanksgiving let your requests be made known to God. And the peace of God, which passes all understanding, will keep your hearts and your minds in Christ Jesus." When St Paul wrote these words he was in prison in Rome and would have been aware that he was almost certainly facing the possibility of execution. Similarly, he knew that those Christians in Philippi faced all kinds of dangers and persecutions as they set out on their journey of faith. But Paul still proclaims, with words that flow out of his own heart – Rejoice! St Paul was teaching the Philippians, and us, that Christian joy is not dependent upon the immediate and ever changing circumstances of our lives but on the continual presence of Christ dwelling in our souls and living in our hearts. It is a joy which springs from the indwelling of Christ in the soul through the gift of the Holy Spirit. It is a joy which is nurtured in a state of mind and in an orientation of the heart. "Finally, brethren, whatever is true, whatever is honourable, whatever is just, whatever is pure, whatever is lovely, whatever is gracious, if there is any excellence, if there is anything worthy of praise, think about these things. What you have learned and received and heard and seen in me, do; and the God of peace will be with you." Here, St Paul is recommending more than just positive thinking. When he talks about what they have 'received', the precise term he uses means to accept a 'fixed tradition'. This then is about living-out the apostolic faith which St Paul has handed on to us. By doing this, the gift of God's love will live within us. "Father, may they be one in us, as you are in me and I am in you… I have made your name known to them and will continue to make it known, so that the love with which you loved me may be in them, and so that I may be in them." St Philip Neri lived out that apostolic faith and passed it on in an exemplary way. 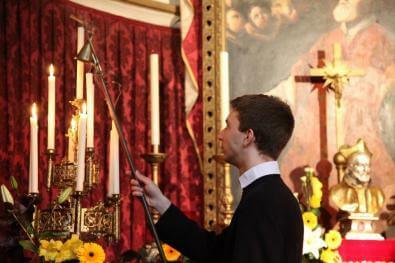 Indeed, it is the example that each Saint gives to the Church, a confirmation that the apostolic faith we have received can be a source of deep spiritual peace and joy. As a result of St Philip Neri's life of service, meeting the spiritual and charitable needs of many people within the Eternal City, we recall that like St Paul he too came to be called an Apostle - the 'Apostle of Rome'. The name Apostle is apt when we also remember that what distinguished the first Apostles was that the fire of Pentecost was for them a personal experience. St Philip too received a personal experience of the Holy Spirit in the globe of fire which entered his heart and bestowed on him the gift of spiritual joy, the fruit of Pentecost. 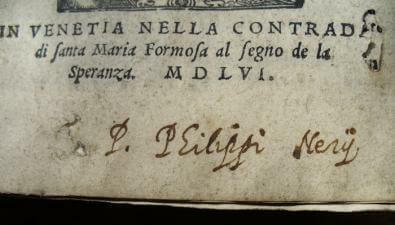 When St Philip went to Rome he took with him some books which he had kept with him from his young days in Florence. 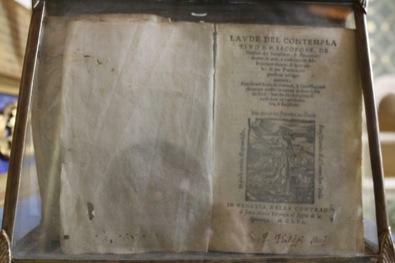 One of these books was the Laudi, or spiritual canticles, of Blessed Jacopone de Todi. The second object I found in that reliquary cupboard? Well it was that very book. Living in the last half of the 13th Century, Jacopone, nicknamed 'Crazy Jim' in his day, was a Franciscan poet and song writer, who was known to break into song whenever he felt in distress or in trouble. Noted as St Philip was for his strange behaviour on occasions, we can well see how the spiritual canticles of Blessed Jacopone da Todi may have had a significant influence on him and why the singing of laude formed an essential part of those meetings in the Oratory built above the Church of San Girolamo della Carità, the beginning of the Congregation of the Oratory. 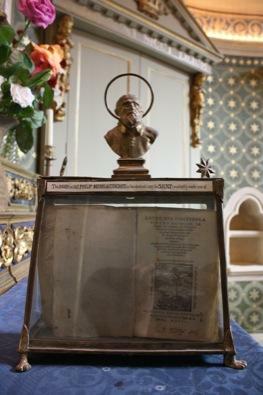 After finding that ancient book of Jacopone da Todi and the death mask of St Philip in the reliquary cupboards, I placed them on the altar of the church and sang that great hymn of praise to God, the Te Deum. Knowing as I did that within a few days, the first of the Oratorian Fathers would be arriving, I wished to give thanks to Almighty God, knowing that it was His providence that would bring them here to this church and that St Philip would be here waiting to greet them. "O Love, divine Love, why do You lay siege to me? In a frenzy of love for me, You find no rest. Hearing, sight, taste, touch, and scent. To come out is to be caught; I cannot hide from You. Inviting me to come to You, to dwell in You. I cannot escape Love through this gage. "Love, divine Love, hungering Love! You have caught me on Your hook, for you want to reign in me." And wounded me through that fragrance. To try to flee from You is madness. I cease to be me and can no longer find myself. O Love without limits, who is it You love? There I suffer to see Your wounded heart. So that I might be healed."